I’ve been fighting my 30s ever since I realized I was no longer in my early 20s. Luckily, I have my mother’s skin; however, for a few critical years I took this genetic gene pool benefit for granted. One day I woke up and realized I had wrinkles! So I did what every sane 28-year-old woman does and began searching for grays. Thankfully I color my hair every six weeks so those, whether I had them or not, were nowhere to be found. My next line of defense was putting a better moisturizer on my skin and stop buying the same brands and formulas I used when I was 16. 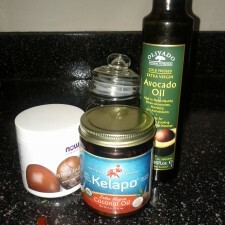 As soon as I started working with Kelapo Coconut Oil, I started putting it directly from the jar to my face. I noticed how soft it made my skin feel and gave me back my “I’m still in my 20s” glow. So when I found a way to improve upon what I thought was perfection, I said why not? If you’re battling the wrinkles, or just want an organic moisturizer, try this delicious Three Ingredient Moisturizer, adapted from Eating Bird Food. 1. Melt Kelapo Coconut Oil in small sauce pan. 2. Mix shea butter and avocado oil. 3. 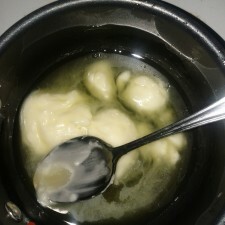 Stir until shea butter is melted. 5. Spoon mixture into seal tight jar, shake. 6. Let moisturizer sit until it solidifies. I put mine in the refrigerator for about an hour before moving it to my vanity. I immediately put it on my face that night and made my boyfriend feel how soft my skin was. I’m willing to put money on the fact he’ll be using this just as much as I will. You just need a small amount, so this batch should last you a while (even if you are sharing!). Ready to make Kelapo Coconut Oil a part of your beauty routine? Try our Hair Mask and Lip Balm as well. Why don’t you manufacuture the mosturizer? Bet it t would be a good seller. And what is shea butter? Thank you for your kind words! Maybe one day we will be able to manufacture the moisturizer! Shea butter is similar to cocoa butter, which is a a great for the skin! is this too thick to put on my face?? I am afraid this is too oily for my eye or clog pore, would it cause any millia, blackhead or whitehead. A little goes a long way with this moisturizer, but it is not too heavy for your face. The shea butter is the thickest ingredient. Perhaps try that alone on your hands to see how your skin reacts to it. Let us know if you have any other questions!